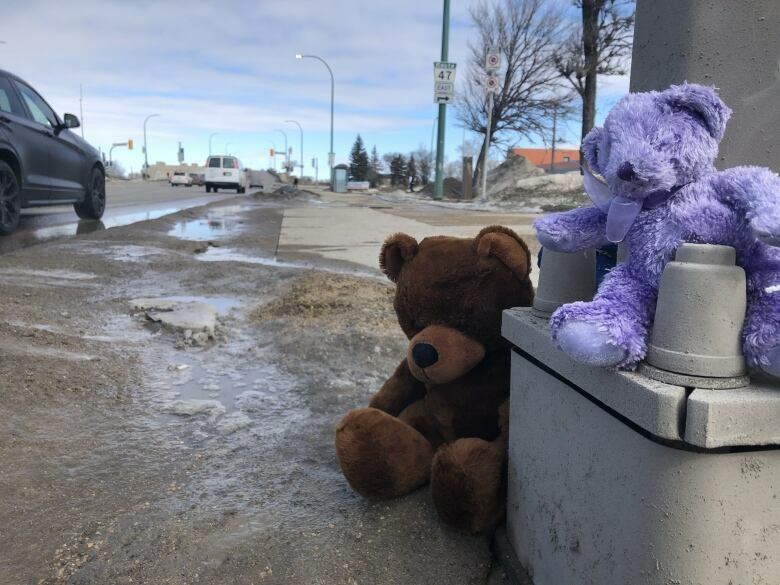 Community members raised concerns years ago about pedestrian safety on the stretch of a Winnipeg road where a four-year-old girl was struck and killed by a vehicle this week, according to a community advocate. More than 100 people gathered Friday evening at the crosswalk where a young girl was hit by a vehicle and killed this week to pay their respects and pray for her mother's recovery. 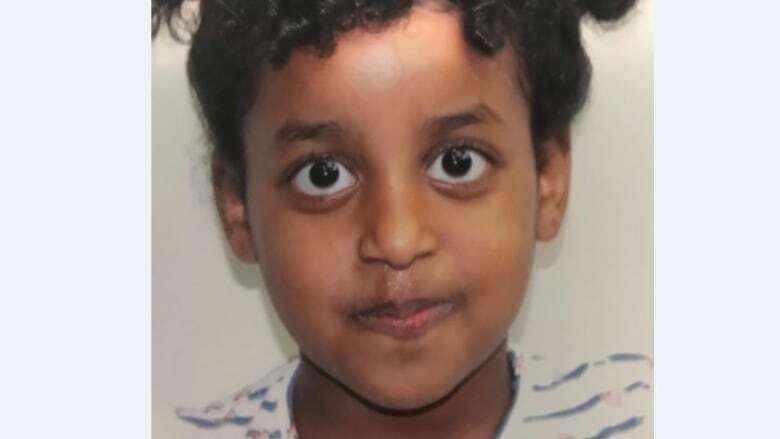 People stood in silence at the intersection of Isabel Street and Alexander Avenue, where four-year-old Galila Habtegergish and her mother Genet were struck while crossing the street Monday. Galila died the next day. Genet remains in critical but stable condition in hospital. 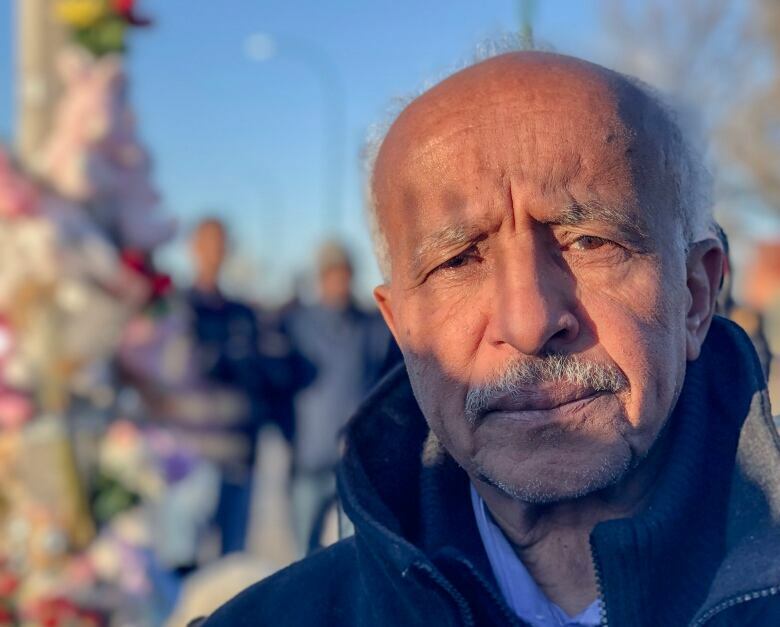 Her husband, and the father to Galila, covered his mouth with a scarf and wailed on Friday as he walked to a memorial — a mound of toys and flowers at the base of the crosswalk post — and dropped to his knees. Members of the community surrounded him and gently rested hands on his shoulders and back as the man's cries grew louder until he collapsed backwards to sit on the ground. They helped him up, keeping him steady as he got to his feet and leaned into their embrace. The man then stood by to watch the vigil, which included speakers from the community and Indigenous drummers. "This is an impossible tragedy to understand. But having all of you with us, it gives us strength and courage," said Dorota Blumczynska, executive director of the Immigrant and Refugee Community Organization of Manitoba (IRCOM). "Please keep our families in your prayers. Please remember that Genet, the mother, she will need us for a long time." Genet's husband alternately stared blankly into the distance, wiping tears, or broke into long bouts of cries as people walked over to console him. At times, the First Nations drummers in attendance were almost drowned out by the traffic zooming past the busy intersection. 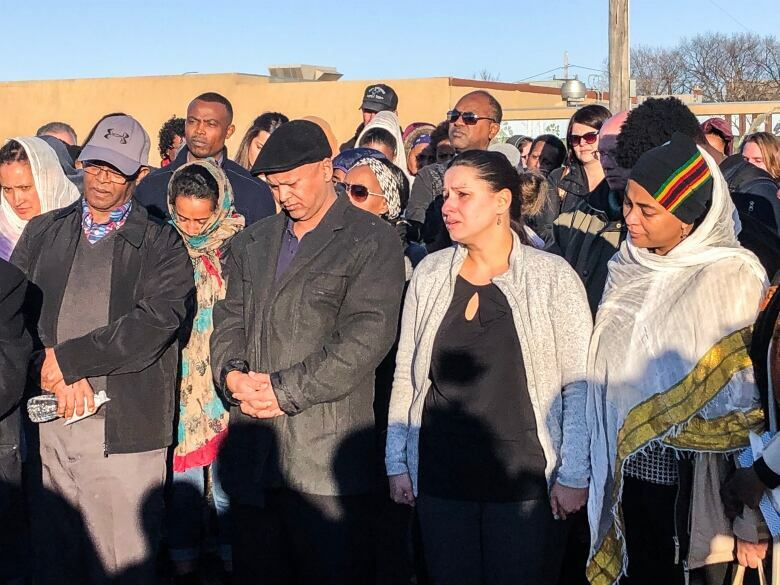 "It's really heartwarming," said Aaron Mehzenta, a leader in the local Eritrean community and a friend of the family, about the crowd attending the vigil. "I never expected this many people from all walks of life to come here the way they have. I thought it was only going to be our community coming, but it's everybody." He said Genet faces a difficult recovery. "Thank goodness, I think she's going to survive, but whether she'll be able to walk is another question. It looks unlikely," Mehzenta said. Monday's tragedy happened barely one year after another child from Eritrea was hit and killed by a vehicle in a crosswalk. In light of that, as well as a collision on Osborne Street Wednesday that left another pedestrian in critical condition, Mehzenta said the city needs to address pedestrian safety. "This is happening again and again ... this has to stop," he said. "I think it's about time that the city of Winnipeg learned something from other cities and did something about it." It's a familiar plea to Blumczynska, who said community members sounded the alarm nearly three years ago about pedestrian safety on the stretch of Isabel Street where Galila and Genet were hit. "We had already heard that there were near misses and vehicles weren't waiting," said Blumczynska. "They would barely [have] pressed the button and vehicles would be racing behind them." IRCOM had been helping Galila and Genet's family settle into Canadian life, and taking on the responsibility of teaching them how to correctly navigate the streets of Winnipeg. "Part of what [our staff] do is talk about neighbourhood safety and help families use things like crosswalks," Blumczynska said. "My colleagues said they had practised that very crosswalk the Friday before … so there's a lot of profound sadness." Worries surrounding that stretch of Isabel were something which kept coming up in conversations with residents since IRCOM moved into the area in fall of 2016, according to Blumczynska. "We hold regular community meetings and the [pedestrian] safety concerns have been brought up every time," she said. Despite the concerns, Blumczynska was unable to lobby support from the city to install traffic lights at the intersection of Isabel and Ross Avenue, two blocks south of Alexander, through a letter they sent in 2017. She said it has weighed on her mind ever since. "I have moments where I feel terribly, terribly guilty because I do wonder if I should have fought harder or argued more or … provided some further evidence," said Blumczynska. At the end of the day, Blumczynska said it's her job to to speak to the community, and she feels somewhat responsible for changes not being made. "I'm going to continue to have to answer to our community if nothing is done," she said. Blumczynska said she's frustrated the voices of people who navigate the intersection daily seem to have been ignored. "At the end of the day I think someone … made a decision who is removed from here, who doesn't have the lived experience of trying to navigate that street as a pedestrian." The area has a handful of high-traffic destinations, including Dufferin School, a community centre and restaurants. Blumczyska doesn't mince words when it comes what changes need to be made. "We want to see a signal light on Isabel and Alexander because there are 200 children in the school. There are many young families and many children crossing across four lanes of very fast traffic," she said. "We need either raised crosswalks, a signal light and we need a reduced speed limit and we need a lot of ticketing and more ticketing until everybody gets the point." She said these changes need to happen immediately, or the amount of traffic going down Isabel needs to be rerouted. "I just I can't imagine that in a suburban development filled with homes where people expect children to be present that anybody would be going at these speeds and disregarding things like crosswalks that ensure the safety of pedestrians but it happens here because it's taken for granted," she said. Many of Blumczynska's colleagues and staff are Eritrean, making the loss doubly hurtful to deal with. "When good things happen, we celebrate together, when terrible things happen we equally grieve and mourn together," she said.